In the early seventies I was hired as Club Professional of the Elmvale Figure Skating Club and taught therefor six enjoyable years. The parents of my students were most supportive and were willing to help on any suggestions. I found the children a pleasure to teach as they seemed so willing to learn. With the help of two young ladies who I taught at the Barrie Figure Skating Club, Debbie Chappel and Mary MacPherson we managed to create group lessons were we taught figures (which are now abolished), free skating and dance (the fun part of skating). We would prepare the students for tests that were judged at the end of the year. I was so proud of the skaters as they did very well on their tests. Every year we would put on a skating carnival. This consisted of picking a theme, deciding who was to do the solos, pairs and group numbers. 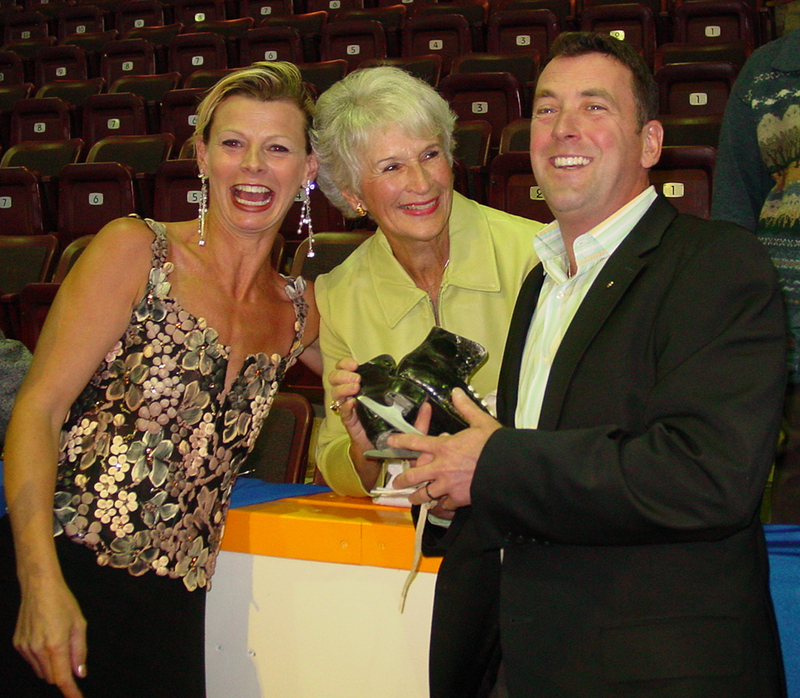 A guest skater was invited and one year we were fortunate to get Brian Orser. My first encounter with Brian was when I taught in the Midland Skating Club. He was a very enthusiastic young lad who wanted you to watch everything he did and was fun to teach. I can see him today saying Mrs. Wittick watch my shoot-the-duck. He certainly has come a long way. Now I watch him with his students on TV. Brian was meant to skate and so much determination for the sport. He accomplished his goal in life with a lot of hard work and dedication. Back to the carinal, music had to be picked, routines planned and taught to all the skaters. In my early years with the Ice Follies in San Francisco we would train for the new show every day for the coming season and skate the old shows every night. This gave me training on how to put a carnival together. I would design the costumes for each number and the parents costume committee did a wonderful job of making sure every skater had a costume. This committee made things happen. I sure could count on them. Another committee put the backdrop together and supplied the props which was so helpful. My husband who was a music teacher would help me with the preparing of the music for the show. We spent a lot of hours getting it just right and putting it on a master tape. I wrote a script for the announcer and had to find somebody with a sense of humour to announce the different numbers. Opening night the skaters would be bustling about and I would be running around making sure they got out on time. They never let us down and we were so proud of them. When you are teaching you are always rewarded when you find that special person that grasps what you are trying to teach them. I was so fortunate that Michelle Simpson was one of those gals. She was shy, hardly said two words but I found the major potential in her. She was like a little sponge that absorbed everything you showed her. I got her through her preliminary and first figure test and with the support of her parents I called Doug Leigh of the Mariposa School of Skating to come and observe her. He agreed to take her on as a student. Should I say the rest is history as Michelle became a great skater and an exceptional coach and life goes on.